Where did archeologists find Mithraeums? 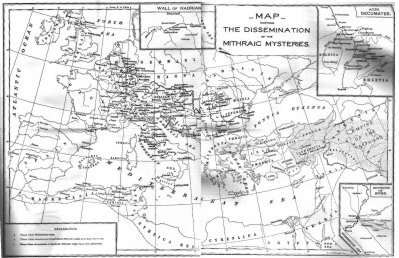 In his Mysteries Of Mithra Cumont has a map from Roman times and notes where Mithraic findings have been done by archeologists and where Mithras-temples (“Mithraeums”) have been found. For years I have wanted to visit one of these temples and some of the marks on the map are even not that far away from where I live. The closest Mitraeum is marked at “Vetera”. It took some investigation to find out that nowadays this is Xanten in Germany not too far from the Dutch border. My girlfriend knew about an archeological park in Xanten where a Roman city is being excavated. Still, nowwhere could I find information about a Mithraeum in this park. Digging up old folders of the time that my girlfriend visited the park as a girl proved that the park is called “Colonia Ulpia Traiana” after the city, but that “Vetera” was an army-camp a few kilometers away. Since Mithraism flourished mostly under soldiers, this would be a more logical place for a Mithraeum, but still nobody could tell me if this temple is still there. We decided to take the change and drive to Xanten to find out ourselves. After seeing the amphitheatre in Birten (near Xanten) a walk to camp Vetera led us to the conclusion that nothing remains of the camp. So we went to Xanten and its museum and found three Mithraic artifacts, two stones with engravings and a small, damaged statue of a torch-bearer. No Mithraeum has been found near Vetera, but these three things suggest that there may have been one. Quite a disapointing finding which makes me even more unsatisfied about the fact that nowwhere on the internet have I been able to find just a simple list with places where Mithraeums have been found, where they can still be visited and for example where Mithraic artifacts can be seen in museums (I accidentally ran into a ‘tauroctonic Mithras’ in the Brittish Museum in London a few years ago). All this seems to have been figured out by a Dutch investigator Maarten Vermaseren. He wrote a massive work in two parts (1954 and 1960) called Corpus Inscriptionum et Monumentorum Religiones Mithriacae (CIMRM) which lists and discribes all Mithraic findings known to him. Writing this article I ran into a very interesting internet article which says: “Vermaseren’s Corpus lists 73 Mithraic temples discovered and published prior to 1945; many of them were simply raided for monuments, in others virtually nothing was found”. And from the same article: “54 new mithraea have been published since the Second World War”. The article names various places where findings have been done, but also they do not refer to relatively complete temples that can be visited. So I decided to pick up CIMRM (in the 1954 printing). This work does -as said- have a list with Mithraeums, but the two volumes have nothing more (and nothing less!) than descriptions of ALL Mithraic findings that were known to Vermaseren. He orders them by part of the world (mostly countries) and bluntly gives the information of mostly artifacts. Often he refers to newspapers or scholarly magazines quoting them in their original language. In the papers of the two volumes a large numbers of Mithraeums are mentioned. I hope I didn’t miss any, but here is the list that I destiled from the many pages of the work. The names which I put bold and in another colour are linked to more information on the internet (excuses in advance when links get broken in the course of time). When there is something to mention about the Mithraeum, I included this in brackets. Not too many Mithraeums are written about on the internet and Vermaseren unfortunately has but a few photos of Mithraeums (but many other photos). I included a few photos of Mithraeums that I haven’t ran into on the internet. in Ostia (Italy) Vermaseren mentions no less than 14 Mithraeums! some of which is less known about noways, but he found reports of the 19th century. one is very interesting, because it has a clear depiction of the symbols of the seven grades of initiation. then follows Rome, where ten Mithraea have been found or “may have existed”. the most famous are that under the St Clemente church and Santa Prisca church (see photo). others are located in the Palazzo Barberini garden (found 1936), Piazza s. Silvestro (found in 15th century, but now ‘lost’), Capitoline hill (14th century, but destroyed), Teatro dell’Opera (1932 (see photo)) and Caracalla therms (1912). – Verjuy (Iran). Only logical that in Iran are also Mithraeums, since it was in Iran that Zoroastrianism birthed. Mithras is known mostly under the name “Mehr” and when I ‘google’ for “Mehr temples” I get more hits, but in almost no cases I am sure this concerns a Mithraeum. Click on the place name Verjuy (which is a bit south of Maragheh) and read an interesting article about one Iranian finding. – Mainz (Germany). When digging in the Ballplatz (a square) apparently a Mithraeum was found in Mainz, Germany. I haven’t found too much information about it, but one interesting article can be found here. A (not too good) rebuild Mithraeum can be visited in the Bijbels Openlucht Museum near Nijmegen, Netherlands. Yes, that one of Vermaseren is also to be found above. All the Mithraeums that I knew of at the time of writing this article (july 04) are of course included. 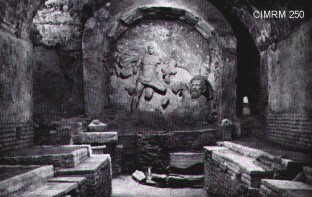 + Ballplatz Mithraeum in Mainz (Roman Moguntiacum), Germany. The scandal prompted the founding of the “Römisches Mainz, e.V.”, a society that a few years ago succeeded in protecting an Isis Temple that would otherwise have been buried under a shopping center. you did not mention the Mithra altar which has been found in the river Moder in Ingwiller (Alsace). Thanks P.! Do you have more information, a link perhaps? This article is quite old and there surely might have been new discoveries or findings that I missed in the first place. Keep the information comming folks, my intend has been to me as complete as possible from the beginning. Another possibility is Burghead, Moray, Scotland for a mithraeum plus see http://www.pictish-mithraism.com to see my hypotheses for decoding Pictish Standing stones in a Mithraic context. Thanks for this information. I’m in Rome right now researching Mithras and I’m having a really tough time finding Mithraic monuments. Erin – if you go to the coast to Ostia Antica there are several sites there but not sure about accessibility. 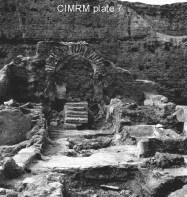 In Rome there is a mithraeum under San Stefano Rotunda (need written arrangement for access), under San Clemente, Circus Maximus, Santa Prisca and Barberini (access by appointment). I have visited the ‘restored’ mithraeum of Jajce Bosnia in September 2013. It was moved in 2012 from a site near one of the two rivers that cojoin in a falls below the town where it probably retained more energy. I suggest a visit to this site only for the artifacts. There is another mithraeum outside of Dubrovnik on the Croatian coast, probably about an hour South. A friend of mine visited in 2000 and at that time, it was a man-made cave hollowed out of a field behind apartments in a small town. Seemed very authentic and not generally known. Your intuition may guide you there. And there was also a Mithraeum in the caverns of Mt. Gargano, Italy, now totally co-opted and obliterated by the luxe shrine to San Angelo. 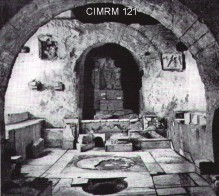 I visited the shrine in 2000 with nothing to indicate that it had once been a Mithraeum. Thank you Roger. That is the Mithraic database that I missed when I decided to write my own article back in the days. I don’t know where all these people have found this information on Jajce temple, but it’s not true – nothing has ever moved. 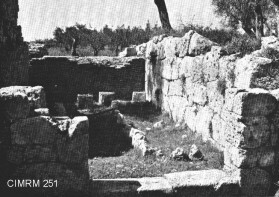 Temple remain on its original site, where has been found (dugout) in 1931. Protective facility is the only thing that was changed over time, built 1931, repaired 1952, and eventually replaced in 2012/13 ! By the way, it’s “Jajce”, not “Jojce”, and country is “Bosnia and Herzegovina”, not “Herzegovina”, not “Bosnia”, not “Herzegonia”….